If you would you like to know more about the Bible, see how the Bible connects with the issues we face today, and have a better understanding of how to use your particular gifts, then this is a course for you. Education for Ministry (EfM) offers a four-year course covering the basic subjects of a theological education: Old Testament, New Testament, Church History, and Theological Choices. You only need register for one year at a time. We meet weekly for about two hours from mid-September through May. The study materials help you examine your own beliefs and their relationship to your culture and the tradition of our Christian faith. EfM can change your life! 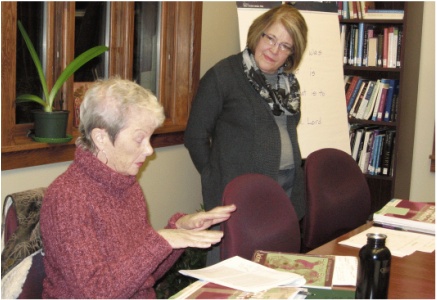 The EfM seminar group at St. Matthias' began in 2006 under the leadership of Kathy Knobel. It is a worldwide program developed by the University of the South's School of Theology, designed to help you move toward a new understanding of the fullness of a spiritual life. Year 1 is based on the Old Testament; Year 2 is New Testament; Year 3 is church history; and Year 4 looks at theological and moral choices.